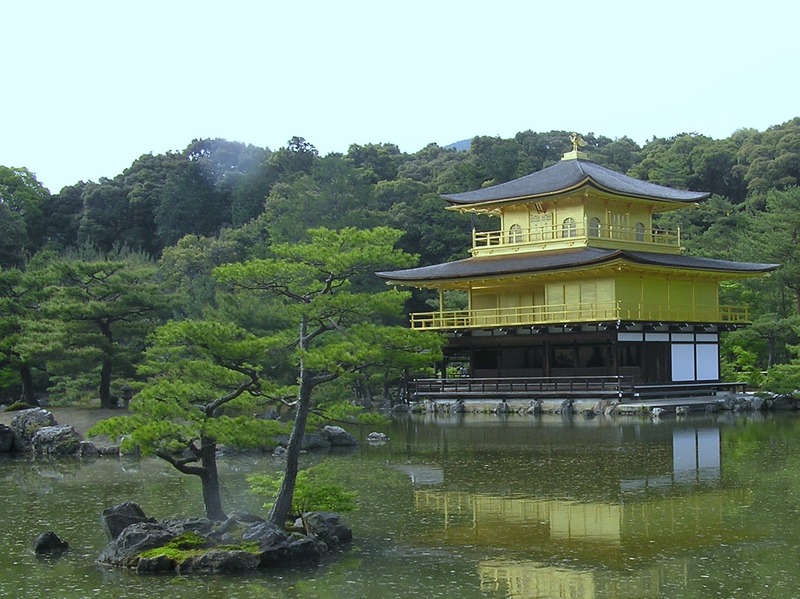 Golden Week is a wonderful time to visit Japan. It is a week of national holidays which includes Showa Day marking the birthday of former Emperor Showa, Constitution Day, Greenery Day dedicated to the environment and finally Children’s Day. Like people the world around, the Japanese celebrate with food and wine. I visited Japan for Cherry Blossom Festival when our daughter was teaching there and among our memories was a fabulous dinner with a local Japanese broadcasting executive and his impressive knowledge of European wines. It’s surprising how much Japanese you can speak after several glasses of wine. When I learned that a number o wineries in Prince Edward County, Ontario were now shipping wines to Japan, I found myself wondering if he will be checking out Canadian wines this year and remembering us, as we remember him. Golden Week also marks the end of the Japanese Cherry Blossom Festival or Hanami which starts in mid April in the south and blossoms its way northward to Honshu Island during Golden Week in early May. Like all celebrations based on nature, the dates are totally unpredictable. When we arrived in Kyoto in late April, the cherry blossoms were gone but the festivities were still going on including the Miyako Odori (Dances of the Old Capital). The Miyako Odori, is an annual pageant put by the geishas or geiko “women of art” as the Kyoto geishas call themselves. It is rare to see even one geisha perform as they charge up to $1,000 an hour to entertain clients in the exclusive Gion District teahouses but, once a year at the Miyako Odori, you can see them all. In 1872, the geishas started the Miyako Odori during the Cherry Blossom Festival to celebrate Kyoto as the artistic capital of Japan. The performance includes traditional dances, dramatizations of folk tales, singing, shamisen and drum music. The sets were beautiful and the kimonos magnificent. All the geiko were involved, from the older geisha who provided the music and singing, to the young maiko (novices). The $100 ticket is a bargain to get such an insight into the richness of geisha artistry. Kyoto is a must-see city on any visit to Japan. Although organized tours are available, we took advantage of the Volunteer Guide Services advertised on the Japan National Tourism Organization website. Volunteer Guides are Japanese people in each city who like to practice their English and are delighted to help visitors plan a personalized tour. You must apply by email for a guide at least a month before your arrival and develop an itinerary together. The guides do not charge for their services, but you cover their transportation, meals and any entrance fees while you are with them. 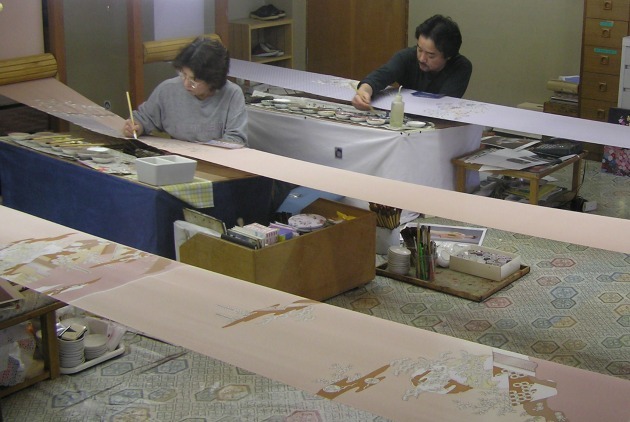 On our first day, our guide, Keiko, took us to the Kodai Yuzen Gallery to see artists hand-paint kimono silk. We visited the Nishijin Textile Centre to watch the weaving of obis, those wide sashes that double around a kimono and are intricately tied to cascade down the back. We saw a kimono fashion show while there. Then we went on to Nijo Castle, the ancient shogun fortress with its “nightingale” floors that sing when walked on to warn of intruders. After lunch, we visited the Golden Pavilion, a three-tiered pagoda in a beautifully landscaped garden. Built as a shogun’s summer teahouse, it was later donated for use as a Buddhist temple. Our day ended at the Ryosanji Zen temple with its small contemplative sand garden and extensive grounds with treed walkways, flowering hedges and sculptured ponds filled with water lilies. Although the cherry blossoms were gone, the azaleas and many other spring blossoms were in full glorious colour. 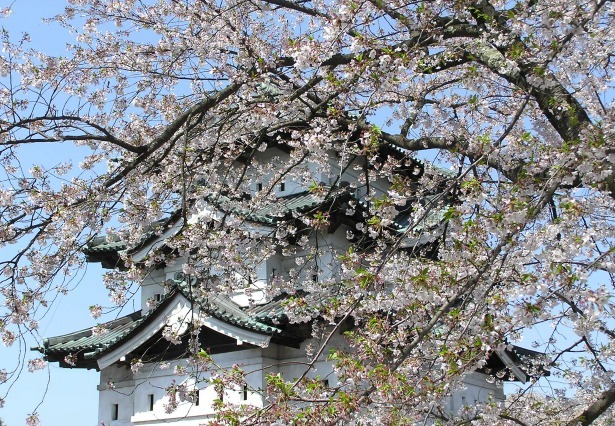 In order to see the cherry blossoms, we used our Japan Rail passes to take the train north to Hirosaki where the ruins of its old castle attract hundreds of thousands of visitors each year during Cherry Blossom Festival. Only a few small buildings remain, but the grounds around the moat and fortress walls have been planted with 3,500 cherry trees of every variety, including cascading sakura. 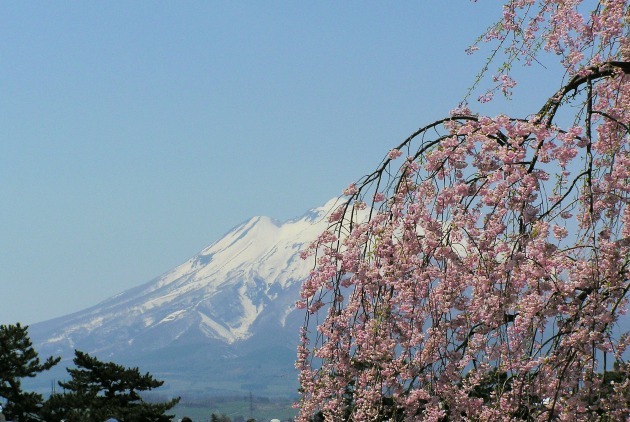 Through a canopy of blossoms like pink lace we caught glimpses of the snowcapped Mount Iwaki volcano in the distance. The day we arrived was the peak blossom day. In the open area of the castle courtyard, there was a food fair with strange and wonderful Japanese treats. Visitors stocked up with goodies then headed to the woods to picnic on their tarpaulins and just enjoy the tranquil spectacle of delicate pink blossoms taking flight and drifting like snow across the landscape. We could hear the heartbeat thrumming of distant Japanese drums, and a band hidden somewhere in the woods far off were playing “Scarborough Fair,” which somehow worked. It was a profoundly spiritual experience of peace, beauty and oneness with nature as the blossoms settled on us like a blessing. In their very crowded country, the Japanese learn to build compartments in their mind where they can be alone even in a crowded subway train. I now have such a mental compartment, where I return periodically to experience again the wonder of a million floating pink petals.